As the prepaid telecommunications industry exploded in the mid 90s, Universal Calling Inc. rapidly became one of the country's largest distributers of prepaid telecommunications products and services. If you are a retailer/store, dealer/distributor/agent, promotional/advertising company, charity, college campus representative, association/non-profit, international importer, or anyone who think they can benefit from custom bulk calling cards, our Wholesale Program is exactly for you. We provide companies with customized paper calling cards, electronic virtual pins, custom e-commerce global websites, Point of Sale (POS), and more. Universal Calling Inc. through CallingCards.com became one of the early pioneers in electronic pin delivery via the internet. Bringing security to customers with speedy delivery was our top priority. We provide a variety of turnkey solutions, as well as granular API services, that businesses around the world can use to strengthen their core offerings. Small businesses and large enterprise alike are given the opportunity to buy PIN products in bulk. If you have already created a means of distribution, you can benefit with our industry low rates, and quality customer service. We have developed web services that can handle your websites' request in real-time while you maintain your calling cards. From our world class calling cards, to our global conferencing solutions, we provide a wide variety of API web services that your company can use to empower your existing business models. Your customers buy a calling card, recharge a calling card, or even update a Pinless number all transparently to the customer. Contact a specialist today to find out more. Our wholesale program also offers preprinted calling cards. These may be manufactured by our company internally, or by other carriers in which you would find in convenient stores and gas stations. If your monthly volume of purchases is $500 or more, our Wholesale Program is exactly for you. We can provide paper cards, or even electronic virtual calling cards for your company. Contact a specialist today to find out more. Development began on what was to be a tool to enable merchants to offer an entire suite of prepaid products without purchasing or storing any inventory. Universal Calling has created the most innovative point-of-sale system which successfully integrates the processing of all major credit cards (MasterCard, Visa, American Express and Discover Card) and ATM/debit/EBT cards with the sale of prepaid products, including calling cards and prepaid conferencing. Universal Calling Inc. is always looking to form new partnerships and business relationships with businesses around the world. If your company provides business services that can be an added benefit to our customers, or are looking for partnership opportunities with our organization, we welcome your correspondence with one of our business development specialists. 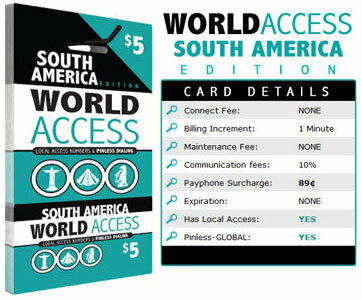 WORLD ACCESS allows you to call globally at incredibly low rates. 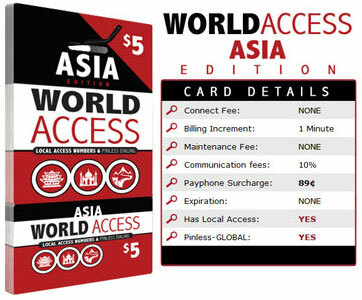 WORLD ACCESS is powered by Callingcards.com. It features local access and pinless dialing. IT's the best global card available. 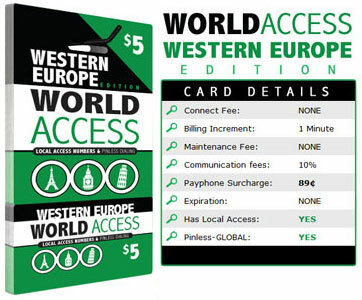 The Western Europe World Access Card provides low rates, time-saving pinless access, and convenient local access from 16 countries! Travelers, students, businesspeople, and anyone with friends or family in another country will enjoy saving time and money with the Western Europe card. 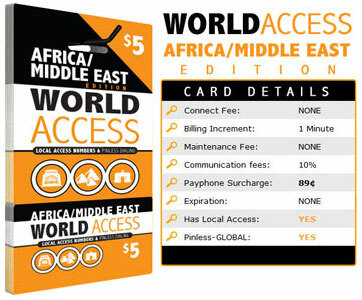 The African/Middle East World Access Card provides low rates, time-saving pinless access, and convenient local access from 4 countries! The Africa/Middle East card will help travelers, students, businesspeople, and anyone with friends or family in another country save time and money on their calls.